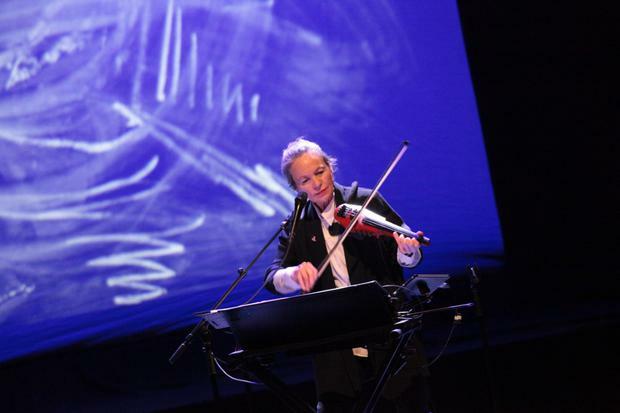 Laurie Anderson’s three-night residency at the NCH began with a performance of “Language of the Future” – a meditation on place and memory and how they intersect with politics in the Age of Trump. That sounded like a lot to chew on and art school pretension was certainly never far away. In her crisp American Midwest accent Anderson (69) delivered dreamy soliloquies that drifted between conversational and deeply affected. Over her shoulder a video screen meanwhile projected images that often chimed thematically but sometimes seemed perplexing just for the sake of it. Thus a picture of Henry David Thoreau's 19th century writing shack spoke to our yearning for belonging but a map of Manhattan under which giant disembodied letters drifted felt merely surreal. Anderson was famously the life partner of the late Lou Reed. Yet where his default setting was brooding inscrutability she presents an open hearted face to the world. Amidst the monologues Anderson played bursts of violin, the minimalism offset by the sweetness with which the pieces were rendered. There was humour too: at one point she put a sort of transmitter in her mouth and hummed maniacally, like a Dalek spitting out a tune. She was never less than amiable and it helps that she has a low and unthreatening voice, so that even her loftiest incantations were conveyed in a folksy lilt. Before us stood one of the great multi-media strategists of the past 30 years – what this evening proved is that her greatest gift may be for feeding her audience high-flown portentousness while convincing them she is merely furnishing spoonfuls of sugar.